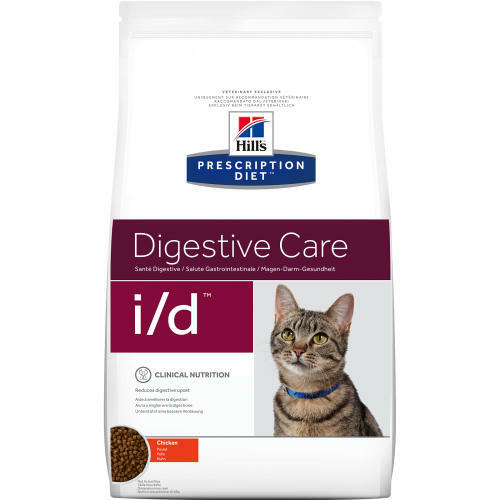 Prescription Diet Feline i/d is a highly digestible formula created specifically to help manage cats with gastrointestinal disorders. Helps neutralise free radicals as it contains high level of antioxidants. Chicken and turkey meal, ground maize, ground rice, animal fat, maize gluten meal, dried beet pulp, cellulose, potassium chloride, digest, flaxseed, calcium sulphate, salt, L-lysine hydrochloride, taurine, L-tryptophan, vitamins and trace elements. Contains EU approved antioxidant. Beta-carotene 1.5 mg/kg, Calcium 0.0107, Carbohydrate (NFE) 0.279, Fat 0.189, Fibre (crude) 0.027, Magnesium 0.0007, Omega-3 fatty acids 0.0042, Omega-6 fatty acids 0.0328, Phosphorus 0.0081, Potassium 0.01, Protein 0.383, Sodium 0.0035, Taurine 0.0019, Vitamin A 11500 IU/kg, Vitamin C 70 mg/kg, Vitamin D 480 IU/kg, Vitamin E 550 mg/kg.